This is a giveaway for 2 tickets and an amazing gift bag to SELF Magazine's annual Workout in the Park event taking place this Saturday (May 10th, 2014) in New York City's famous Central Park. There's no catch. One lucky Mizzfit reader who's ready to sweat and watch some of the latest workout trends play out will win this giveaway. So if you'd like that to be YOU, follow the instructions in this post to enter my giveaway. Don't worry, it's cake. But first, let me tell you a 'lil about SELF's Workout in the Park. It's the ultimate outdoor fit event showcasing new group fitness classes, fit fuel innovations and fitness fashion for you to try out and shop. If you're a fitness fanatic living in or near Manhatan, you don't want to miss this action-packed day. You'll have the opportunity to try a variety of mini classes like Tabura, Rock Yoga, Beach Body and Absolution. Even Crossfiters can get their fix at the Reebok Fit Zone. Tickets run $30 and you'll definitely get your money's worth considering boutique-fitness studio classes in NYC cost an average of $35. Plus, you can expect lots of freebies throughout the day. 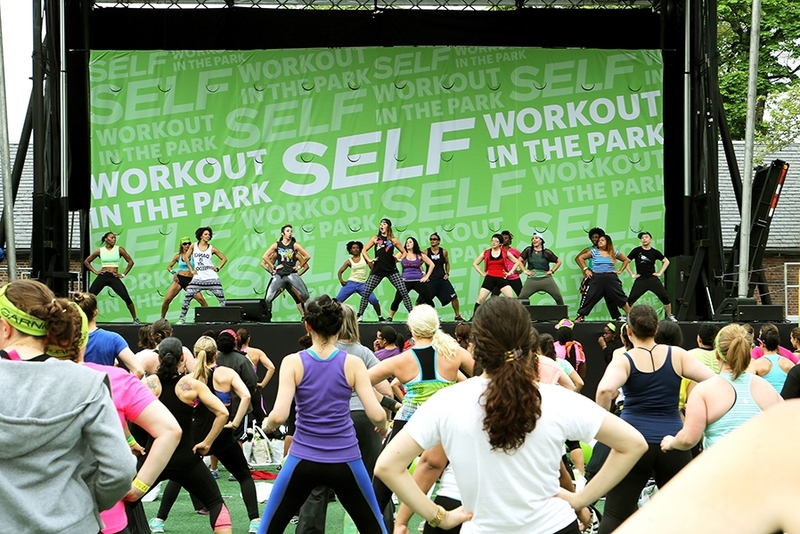 Workout in the Park takes place from 11:00am – 3:00pm giving you plenty of time to take at least 3 classes, watch a nutritional how-to demo, get a beauty consultation and make the swag rounds. This year Bob Harper is hosting SELF Workout in the Park. As if he needs an intro...but just in case you were kidnapped by aliens...he's the other trainer from the popular weight-loss show The Biggest Loser (a.ka. Jillian Michael's pal). He's also a New York Times best-selling author. Harper will be leading his ultimate total body-blasting workout on the main stage and signing copies of his 4th book, Skinny Meals. UPDATE: Giveaway has passed :( BUT, now you get to watch this video below! Check out my coverage from this event and meet the giveaway winner and the friend she took with her. Get a move on it because I'm picking winners Friday, May 9th 2014. Like I said, it's cake. If you don't like entering giveaways (boo), buy yourself a ticket HERE. It comes with a 1-year subscription to SELF Magazine. Once you've got your ticket, head over to Rumsey Playfield in Central Park and enter at East 69th st./5th Avenue. If you see me there, just holler. Haha - Rita, our concepts are basically the same and I didn't see your post before I put mine up! I think we're on to something! Two of us want it, I say we come up with this! Rita: OMG, this is absolutely hilarious! You and Erica are total twinsies! If I were a workout, I'd be "The Social Butterfly." My favorite thing in the world is meeting up with friends, but not enough situations allow you to get a little workout on while meeting up. In my workout, it would be TOTALLY socially acceptable to wiggle around and get your groove on wherever you are and whatever you are doing. I'd also come with a "smart" playlist that is based on you and the people you're meeting up with. So, at happy hour at the local watering hole, while talking with your pals or co-workers, you can be dancing, wiggling, or shaking your thang all to the beats of the group's fave songs. Breakfast meet up? No prob! Have some food and instead of sitting and talking for another hour and continually breaking down that muffin they brought out at the start of the meal and you said you wouldn't eat, you'd stand up and talk and dance. I make social gatherings more fun and active! Never "sit and talk" again...when you have The Social Butterfly, all meetups become "dance and talk"! Added bonus: if you're wiggling around, you won't drink or eat as much! Ooops....I didn't read the instructions, thought the first line was for "subject"....this is mine! Nice one, Erica. You're especially creative today, aren't ya. Loving it! I would be "the mash up" - I'd infuse running, rowing, barre, weights, TRX, spin and somehow add a water element to this all (like spinning in a pool). Of course, it would also be a Tabata workout. I love mixing it up all the time. Love this workout. I'd be covered in ice packs by the end of it!